Millennium Park has become the second most popular tourist attraction in Chicago, drawing millions of people every year to see the Bean and other sights. But as a recent Chicago Tribune article on the park notes, there are few food options inside the park. But several salad bar choices do exist within short walks of the popular outdoor venue. My office is across the street from the park on Randolph and Michigan Avenue, so I’ve explored the salad options in the area. The best choice, and the cheapest per pound, is at the Mariano’s supermarket a few blocks north of the park. Just walk up Randolph Street toward the lake, past the sign that says no access to the lakefront, and keep walking until you see the sign to turn for Mariano’s on the north side of the street. The store itself is tucked away behind high rises in the area. But it’s worth the hunt for it. The salad bar has a choice of container sizes into which you can put romaine lettuce, spring greens, fresh spinach and the popular kale. Accompaniments include the usual such as beets and mushroom slices. Several prepared salads also are present, but they all have too much salt for my restricted diet, so I avoid them. I also avoid the hot food bar, but you may find something on that you can eat without getting too much salt, fat or sugar, let me know if you do. 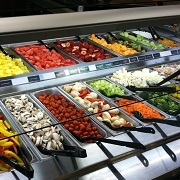 At $5.49 per pound, Mariano’s also has the cheapest salad bar in the area. I regularly load up on two pounds of salad and cut up fruit there. I also sometimes splurge with some salmon sashimi and add it as well. My average lunch there runs about $13. Closer to the park is the Market Creations salad bar in the Prudential building. It’s considerably more expensive than Mariano’s, at $7.68 a pound, and has smaller selection of accompaniments. It also has a hot food buffet favoring Chinese-style dishes but I avoid them because of salt concerns. If you need to eat low-salt, I’d say stick to the salad bar. This place also shuts down by 3 or so, so be sure to get there earlier. A third choice is the food court in the basement of Macy’s, just west of the park via the store’s Wabash Avenue entrances. It has a salad bar down there, but this one is not serve yourself like the other two are. You have to ask someone to make the salad for you. That can take a long time at the busy lunch hour most days, so plan your time accordingly. I’ve avoided the place since one day when I had an endless wait while everyone in front of me picked what they wanted. All three have seating areas where you can eat, or you can get your salads to go and eat in the park. All also offer oil and vinegar so you can avoid the high-salt, high-fat salad dressings. So don’t settle for burgers or some other option that will put you off your low-fat, low-salt, low-sugar diet when you visit the park, head for a salad bar. I love salad bars and these ones seem to be quite affordable. I am not so sure my little town here has salad bars. Thanks for sharing!